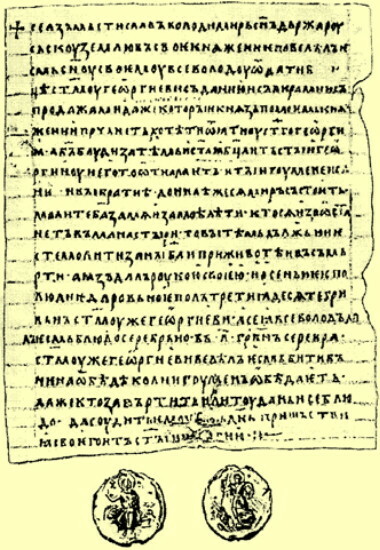 Mstyslav I Volodymyrovych [Мстислав I Володимирович] (Christian name: Гавриїл; Havryil), known as the Great, b 5 June 1076 in Turiv, d 20 April 1132 in Kyiv. 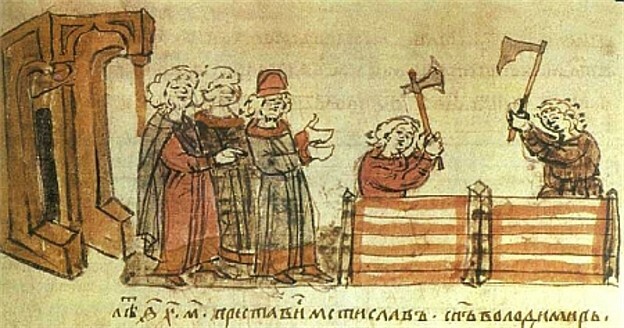 Grand prince of Kyiv from 1125; eldest son of Volodymyr Monomakh and Gytha, daughter of Harold II of England; brother of Yaropolk II Volodymyrovych, Viacheslav Volodymyrovych, and Yurii Dolgorukii. 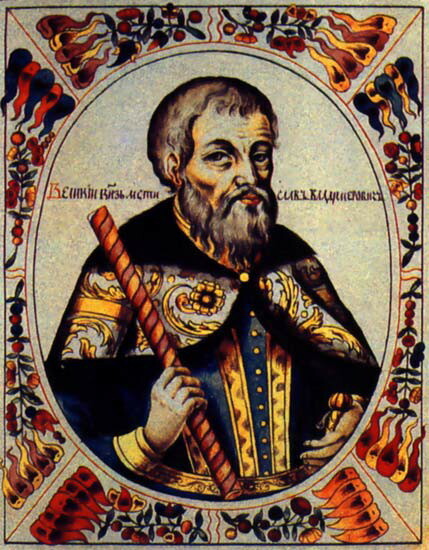 As prince of Novgorod the Great (1088–93, 1095–1117) and Rostov and Smolensk (1093–5) Mstyslav took part in the 1093, 1107, and 1111 Rus’ campaigns against the Cumans. He drove his godfather, Oleh (Mykhail) Sviatoslavych, out of Murom, Rostov, and Suzdal in 1096 and forced him to attend the Liubech congress of princes in 1097. From 1117 to 1125 Mstyslav was prince of Bilhorod, near Kyiv, and coruled his father's realm. After Volodymyr Monomakh's death in May 1125, he ascended the Kyivan throne. With the help of his six sons (among them Iziaslav Mstyslavych, Rostyslav Mstyslavych, and Volodymyr Mstyslavych), his brothers, and his cousins he controlled virtually all of Kyivan Rus’. He subdued the rebellious Polatsk princes in 1128 and gave Polatsk principality to Iziaslav, pushed the Cumans beyond the Volga River and the Don River in 1129, defeated the Lithuanians in 1130 and 1131, and had his sons restore dominion over the Chud in 1131. Continuing the Riurykide dynasty's tradition of dynastic ties he married as his first wife Kristina, the daughter of King Ingi of Sweden. He gave his daughter Malfrid in marriage to King Sigurd I of Norway, his daughter Ingeborg to the Danish duke Knud Lavard, and his daughter Iryna Dobrodeia to the Byzantine prince (later emperor) Andronicus I Comnenus. After Mstsyslav's death his daughter Yevfrosyniia Mstyslavna married the Hungarian king Géza II.